There are certain aspects of every dog that distinguish them as a specific breed. Therefore, if you want to ensure that the Maltese puppies you are considering are healthy and have the desired traits associated with their breed standard, the following is what you need to know when making your selection. First, you should check out the head of the dog. Maltese puppies have slightly rounded skulls and long ears that are well feathered, and lay close to their heads. Their eyes are dark brown, large and oval shaped. The eyes are complimented with black rims and dark haloes, and should convey an intelligent expression. Should you notice when looking at their eyes they appear watery, don’t be concerned. It is natural for this breed to have watery eyes as they are highly prone to tear stain. After examining the eyes of the Maltese puppies, you should then look at the muzzle. A Maltese’s nose should be black and clean. The nose is proportioned to the muzzle and the muzzle to the face and head. Next you will want to examine the mouth of the Maltese pup you are interested in. Gently open the pup’s mouth and check out his teeth. They should be white and straight, forming a perfect scissor bite. Next, with his mouth closed, raise his front, black lips to see if his top teeth slightly overlap the bottom. The next area you should look at is the body of the Maltese puppies. The body is short but is well balanced. The back is level from the tail to the withers. The tail should be arched proudly over the back and is fully feathered. The four legs of a Maltese are short. The front legs are straight, and the back legs are well angulated. The have rounded paws that do not turn in or out, and the pads of the paws should be black. 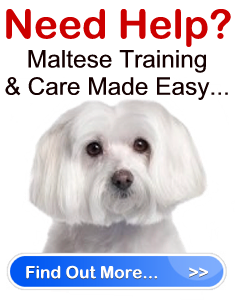 Maltese puppies should move freely when walking or playing. Although they may not appear balanced due to their puppy hood, your main concern is to make sure that they are using all four legs and paws equally. The Maltese’s pure white coat is his most distinguishing feature. It is straight, and silky, and should not be curly or crimped. You may notice that the skin of Maltese puppies is colored in pink and brown patches. This is normal in the breed and is not something you should be concerned about. If you want to find the best looking and the healthiest Maltese puppies, you need to understand the breed standard so you know what to judge and look for. It may seem cruel to judge a puppy based only on his appearance, but you can’t afford not to. Before buying a puppy it’s also a good idea to talk to someone who owns a Maltese to get a first hand glimpse and an idea of what to expect.